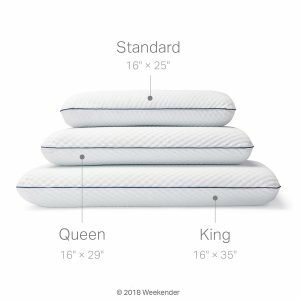 Many people choose a king-size bed and mattress for a comfortable sleep, but not everyone thinks to upgrade the quality of their sleep with a king size pillow as well. 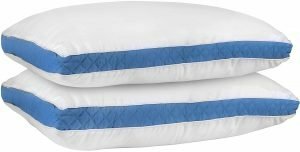 These pillows may be exactly what is missing for your back and neck to get an incredibly good rest. From memory foam pillows to models with a polyester feeling, the best king size pillows on the market help you get a good night’s sleep all night long. But because there are so many models available, it may be difficult to choose the perfect one for your needs. 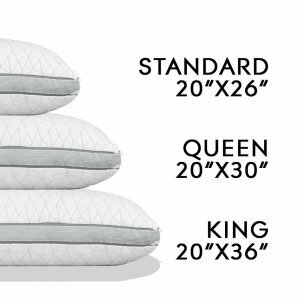 We took it upon us to research the best king size pillows on the market, by taking into account multiple factors such as the type of filling, pillow cover fabric, number of pillows in the set, ease of care, and much more. We spent days comparing the quality of the pillows and reading reviews from users who have tested them extensively in their homes. Below you will find a comparison table that indicates the best features of each of the products we testedб as well as in-depth reviews of each of the pillows. 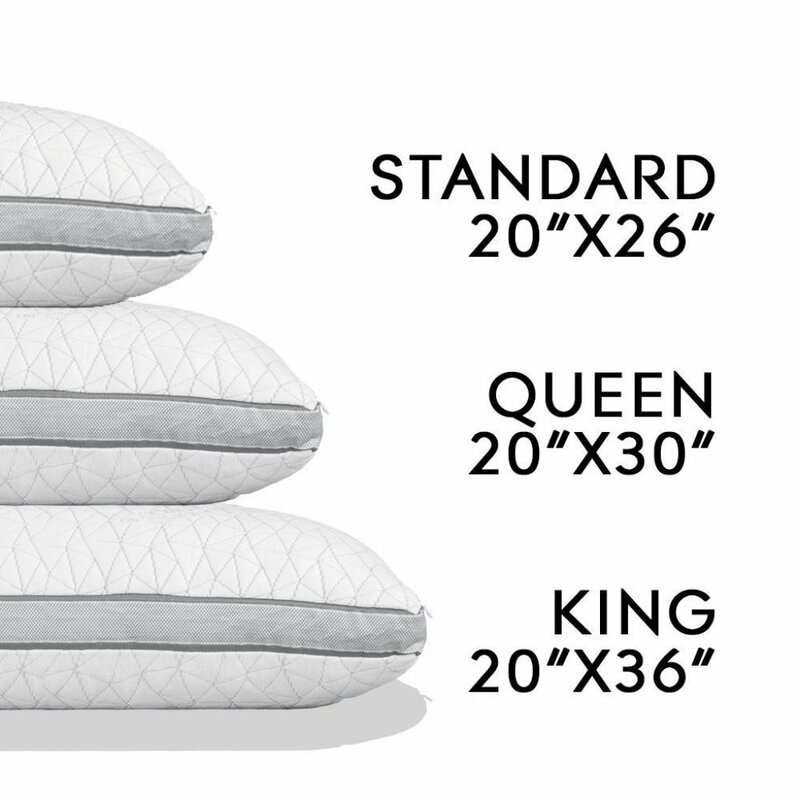 To help you find the best king-sized pillows for your family, we also included a buying guide that includes all the details you may need to make an informed decision. Now let’s have a look at the reviews for the 11 best king size pillows we selected. 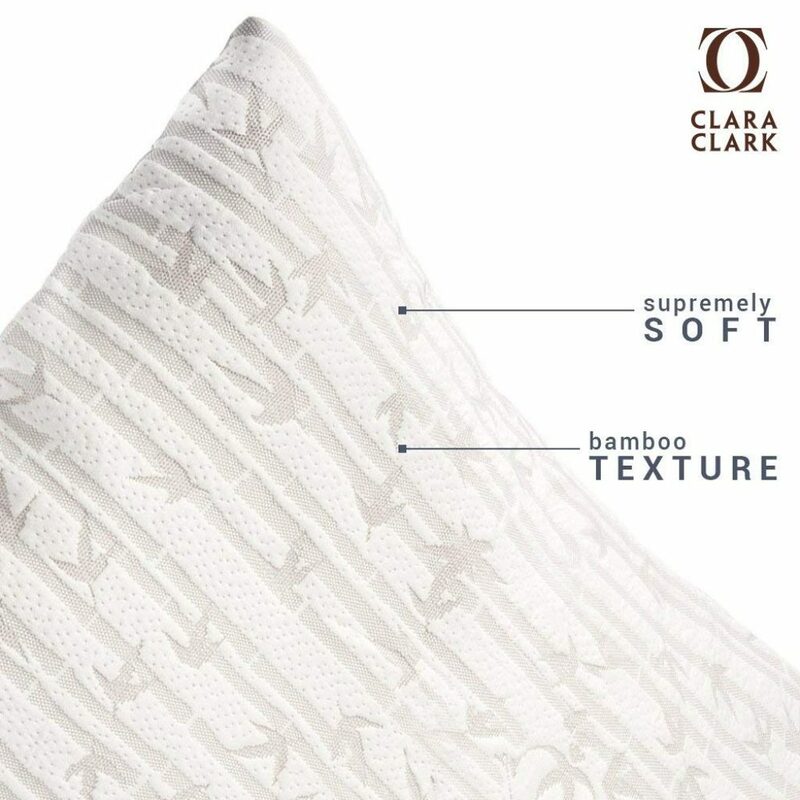 Medium support pillows with pure goose down and feathers for the fluffiest sleep – feels like resting on a cloud! Gel-fiber filled pillows that come in a set of two – quality king size pillows need not be costly! 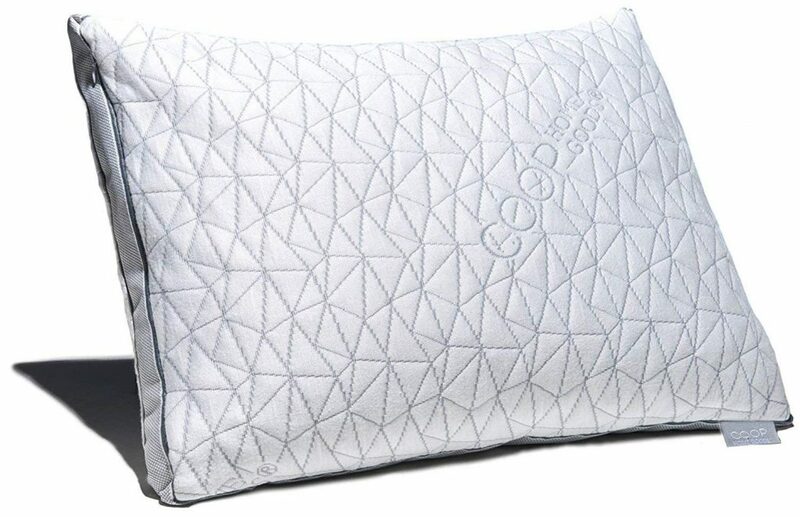 Our choice for the best all-around king size pillow available on the market is the Coop Home Goods – Eden Shredded Memory Foam Pillow, which comes with a 100-night trial and uses a special gel infused shredded memory foam to create what we consider to be the perfect pillow. 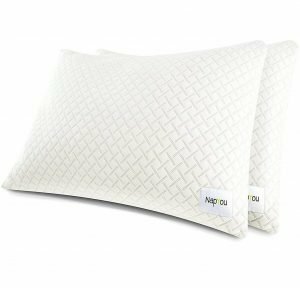 Most users raved about the soft and luxurious feeling this pillow provides, and many of them were amazed by how smooth and soft it feels. The fabric used for the cover is super breathable, which means that you won’t wake up in the middle of the night because of overheating. Moreover, the case is machine washable for easy care and hypoallergenic to suit everybody in the family. What makes this pillow special is the cooling gel memory foam and a microfiber fit that is removable for firmness adjustments. 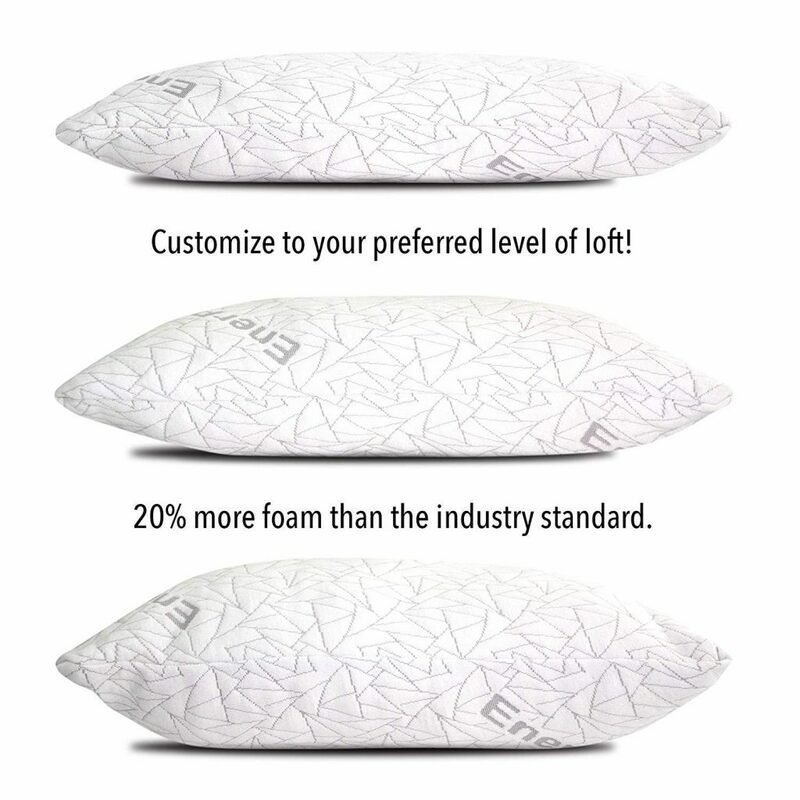 This means that you can take the foam filling out and shape it yourself for a truly customizable pillow. Users also loved that this pillow keeps them afloat all night, unlike other models that feel good at first but then feel too hard or decrease in their supporting properties. 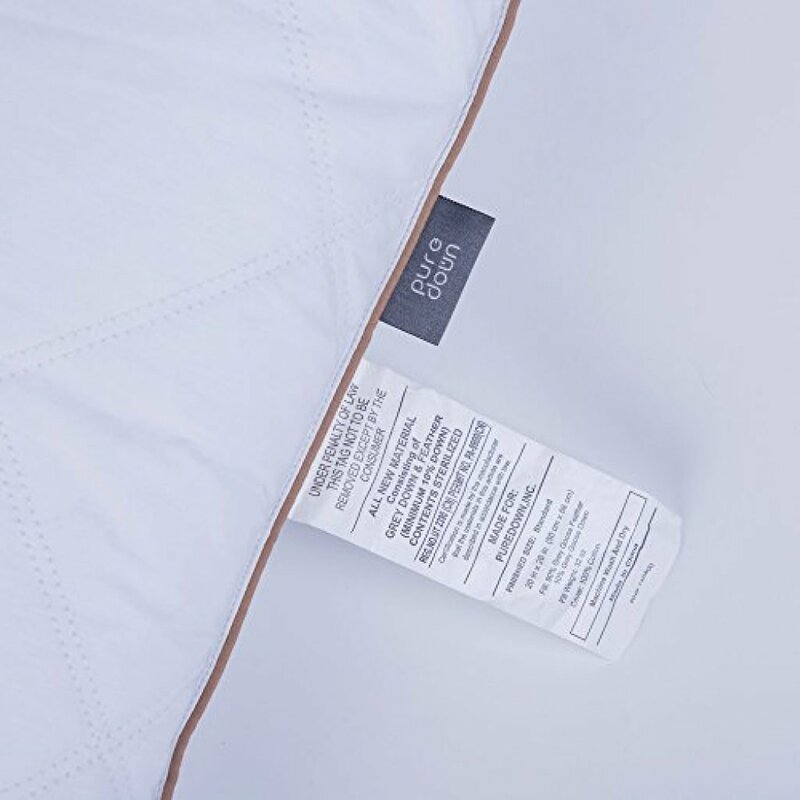 Refill packs are available, so you can add more loft to your pillow, and several users mentioned that this might be a good idea if you have broad shoulders or if you are a side sleeper. 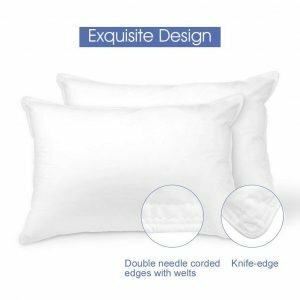 Other users noticed that the pillow is on the soft side, but because its firmness is adjustable, it offers a reliable alternative to pillows that come with fixed firmness. 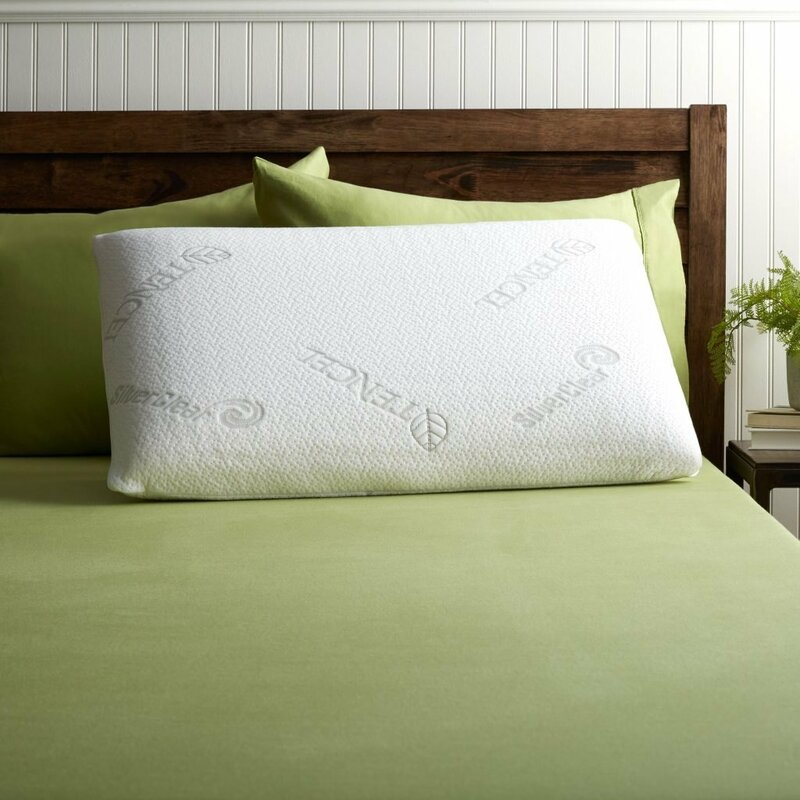 If you are on the market for an adjustable memory foam pillow, the WonderSleep Premium Shredded Memory Foam Pillow is an excellent choice mostly due to its ability to remain cool while being completely adjustable to fit your neck and back. 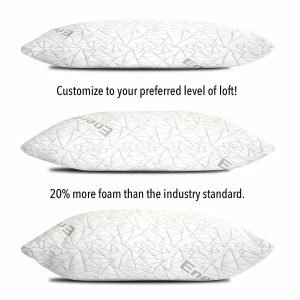 Because you can add or remove foam from the pillow, it means that you can customize it to a level of firmness that suits your particular preferences. 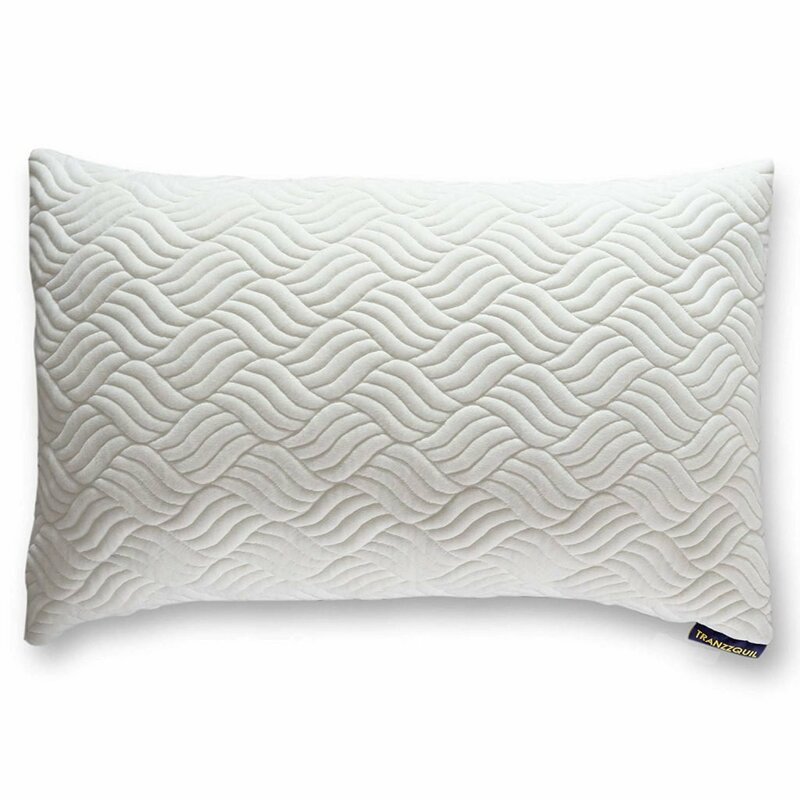 Filled with 100% soft memory foam, this pillow has a cover that contains 40% viscose rayon and 60% polyester. 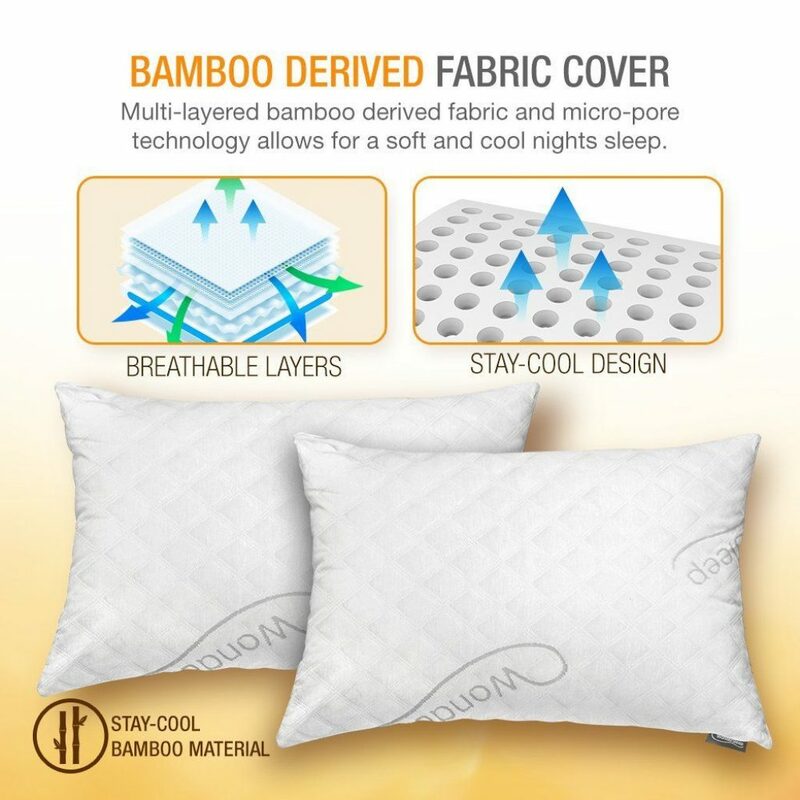 The cool breathable material design means that you won’t suffer from overheating at night, and because the materials are hypoallergenic and dust mite resistant, you can be sure you are allergies won’t flare up during your sleep. Both the cover and the pillow are machine washable for extra easy care. 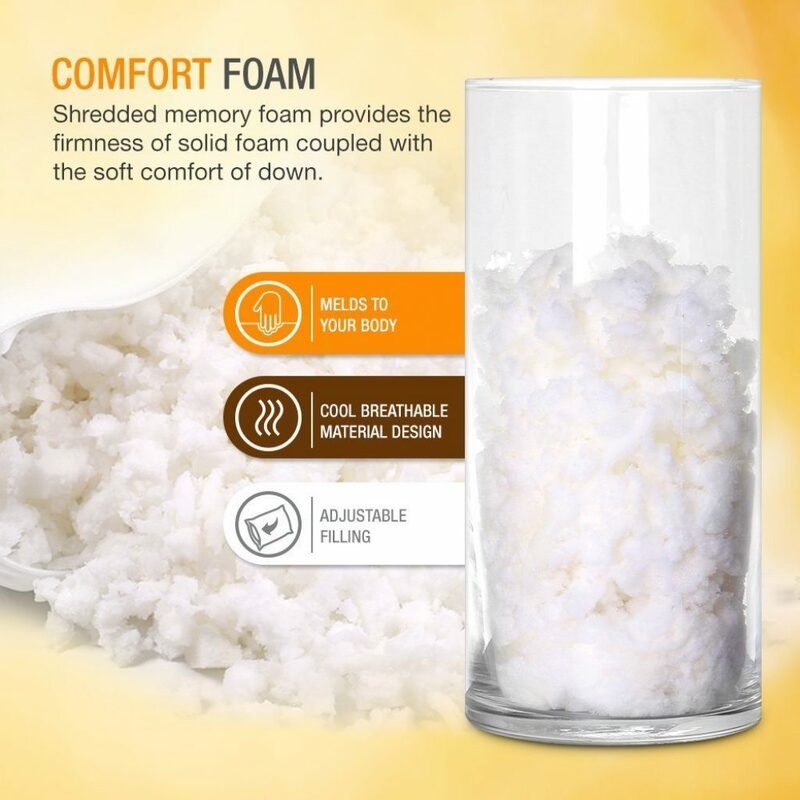 Users particularly like the foam included with the pillow that is of high quality and shredded finely so that it adjusts to your body in a way that few pillows manage to do. Moreover, you can adjust the pillow help you with specific issues such as neck or back pain or if you normally have a hard time falling asleep. The pillow is particularly helpful for those who live in hot climates because it keeps them cool, which is extremely important for the quality of sleep, particularly on humid nights in the summer. 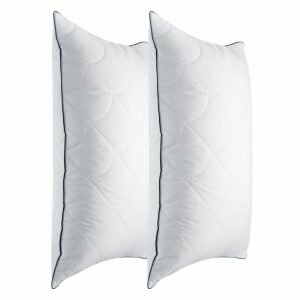 Providing a comfortable plush feeling, this set of down alternative pillows is one of the best choices out there for those who are looking for hypoallergenic pillows that won’t break the bank. Users mostly like that these pillows are not too flat but not too firm either, and that they offer good support and comfort for the neck. Many also mentioned that the pillows are very comfortable to sleep on while fluffing up nicely. One of the main problems with the budget pillows is that many of them fail at holding their shape, but users raved about how this is not an issue with the White Classic Down-Alternative pillows. When it comes to the material the pillows are made from, the polyester microfiber used to create them is designed to mimic the softness and lightness of goose or duck down, hence the name of the product. Real down may trigger allergies for some people, but with down alternatives, you can be sure your pillow is completely hypoallergenic. Moreover, pillows made from down alternatives are generally less expensive, which makes them a great option for those on a budget. 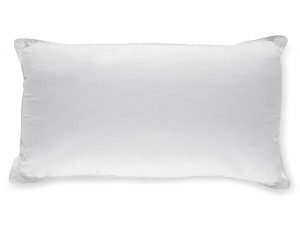 Users also like that this pillow is highly moldable and that it works well for sleepers who like to cuddle with their pillows during the night. This is because they do not conform as closely as memory foam or latex pillows. 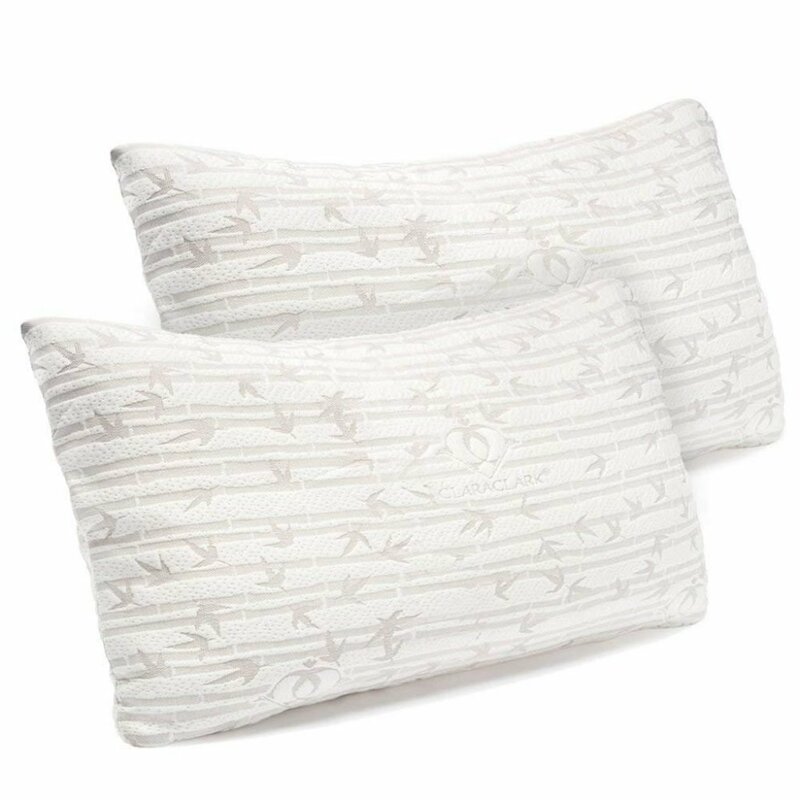 Made from 10% Siberia natural goose down and 90% goose feathers, these pillows are ideal for those who are looking for medium support for their sleep. 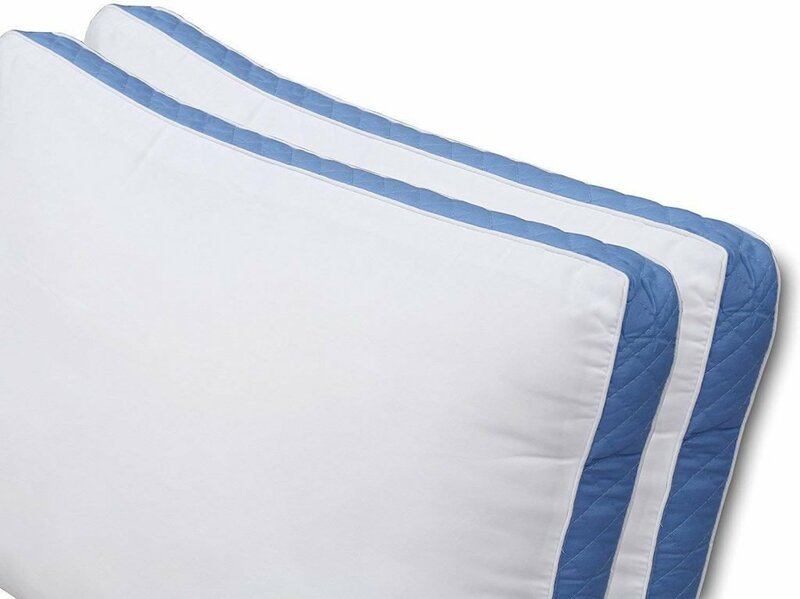 The 100% cotton shell fabric of the cover makes the pillow soft with absolutely no feather picks protruding from it. 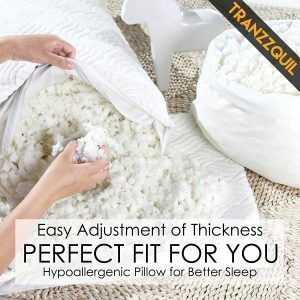 Many users who reviewed this pillow mentioned that they felt less pressure on their body when sleeping, and they also liked that the pillow remains fluffy for longer than many of the other pillows available on the market. 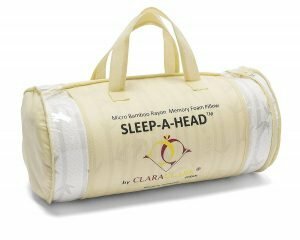 This set of pillows also received praise from users who achieved a restful night’s sleep after they had suffered from migraines and neck pain in the past. Because the pillows have 36 ounces of down and feathers, they offer medium support. The cover is made from 100% cotton with a 233-thread count that keeps the pillow breathable and comfortable at the same time. 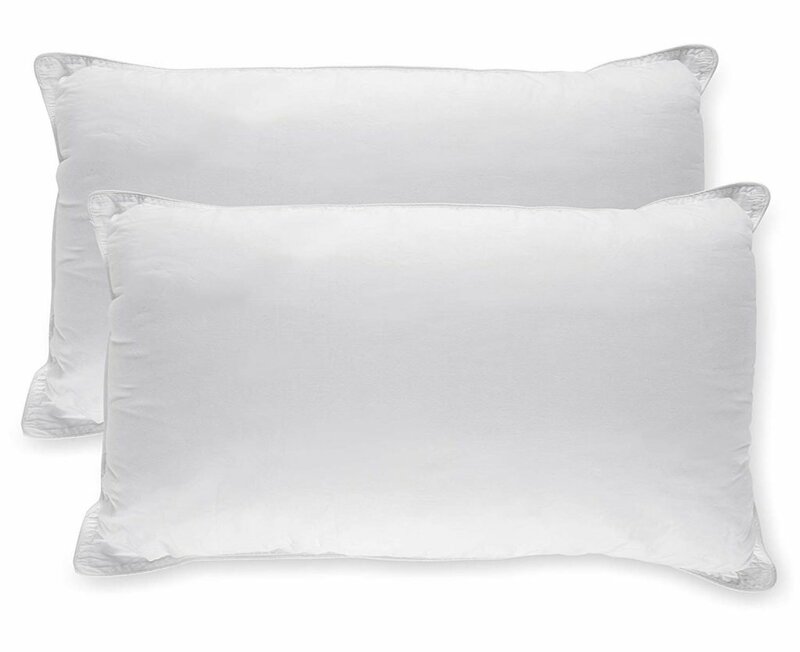 Just like many of the feather pillows out there, you can expect the puredown pillows to have an initial odor, but this is something that will not persist for more than a couple of days. The set of pillows comes in a vacuum-packed bag which keeps them safe for shipping and make sure the pillows remain disinfected. Finally, users love that you can achieve a full plump for the pillows simply by shaking them up a couple of times. 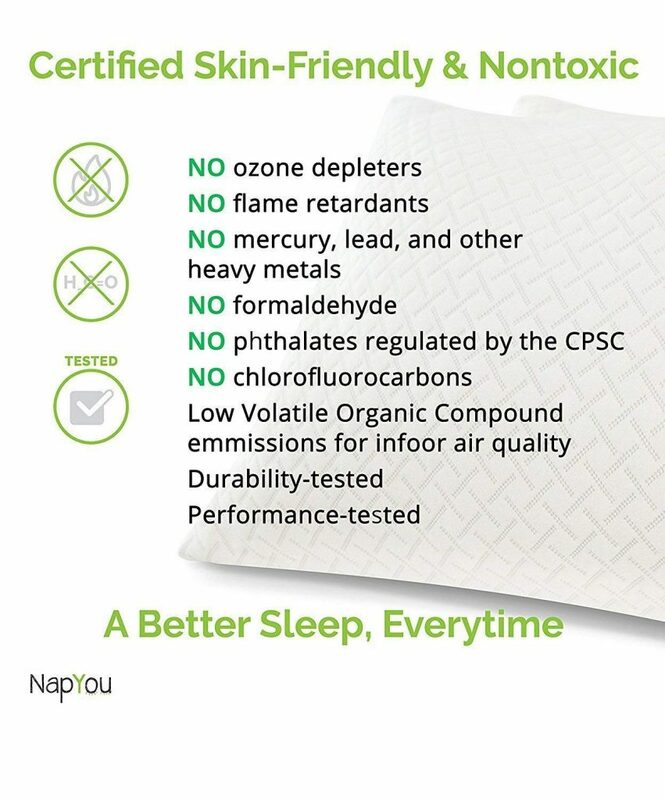 Created from a mix of 40% organic cotton and 60% polyester, the NapYou Shredded Certipur Memory Foam Pillow is a comfortable pillow that offers optimal support for the neck and back, being suitable for stomach, back, and side sleepers. The washable, removable cover is made from organic cotton with a very soft feel and it’s highly breathable, so you avoid overheating. 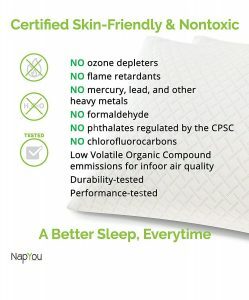 One of the reasons the NapYou Shredded Certipur Memory Foam Pillow is highly praised by users is the fact that it doesn’t go flat easily. The pillow contains CertiPUR-US certified foam, so you can be sure it is free from flame retardants, heavy metals and other chemical substances that may trigger allergies. 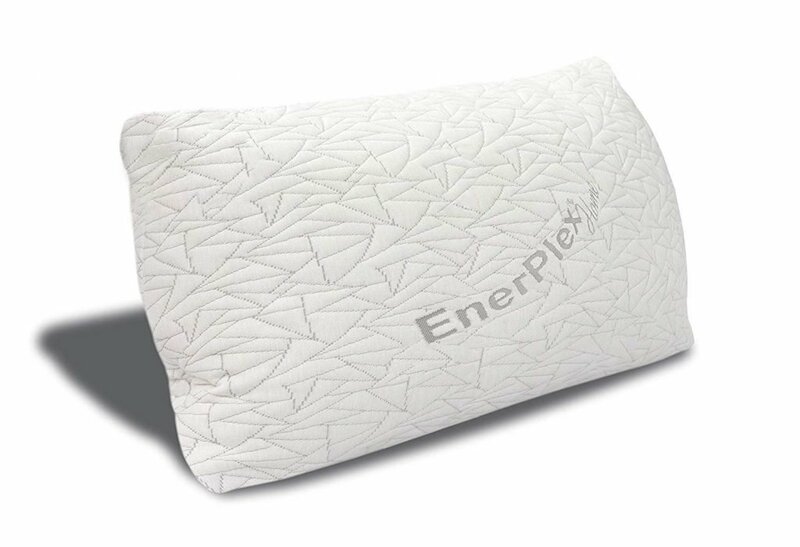 This is one of the few king-size pillows on the market that is suitable for all types of sleepers, and many users have mentioned that sleeping on this pillow eases their headaches and back pain, while making them feel much more rested. They also noticed that the pillow doesn’t compress much, and several users added that it retained its shape and fluffiness almost intact even after months of use. Users also like that the pillows come well-packaged and that they don’t take too long to expand. Finally, the pillows do not require machine washing. 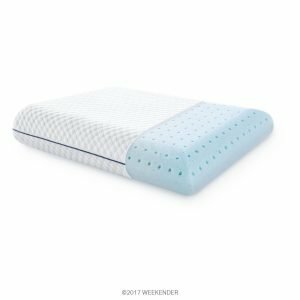 Built for back support and pain relief, the WEEKENDER Ventilated Gel Memory Foam Pillow is one of the best choices out there for those who want a temperature-regulating gel pillow that is also useful for pain management. Because it features a ventilation system that optimizes air circulation, this pillow is highly breathable, and many users mentioned that it does a good job at remaining cool even on humid summer nights. The pillow has a 5-inch loft, which means that it keeps your spine properly aligned, offering you relief from any back or neck pain. Users mentioned that the quality of their sleep had improved significantly in just a couple of nights after they started using the pillow. 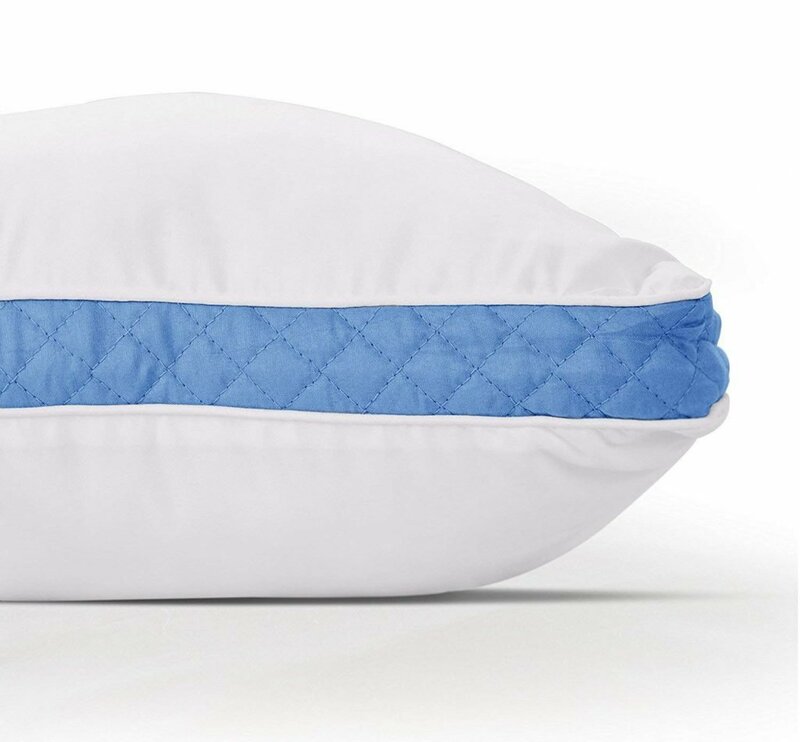 The Weekender pillow comes with a removable, soft pillow cover that is machine washable for easy care. Moreover, the pillow has a three-year warranty, which is not something you find in many pillows. Even though the foam material is not adjustable, users mentioned that the medium-firm feeling of the pillow is suitable for just about any type of sleeper. You can expect the pillow to feel firmer than traditional down pillows. It comes compressed and rolled in a box, and it only takes a couple of minutes to decompress for immediate use. 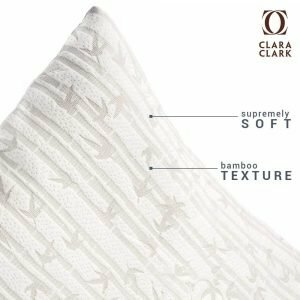 A soft and hypoallergenic pillow that is a perfect choice for stomach sleepers, the Clara Clark Premium Shredded Memory Foam Pillow has received extensive praise from users for the way it aligns the body for an excellent night’s sleep. The pillow offers natural support for your head and neck, allowing your muscles to relax properly. The shredded memory foam filling allows the airflow to circulate, which results in a pillow that is highly breathable. Users also mentioned that the pillow remains cool even during hot summer nights. The pillow comes vacuum packed, but it extends immediately once you take it out of the package. 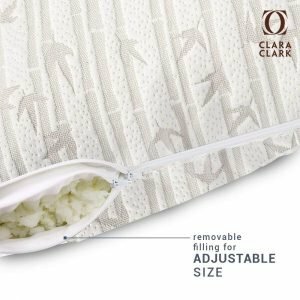 Another benefit of the Clara Clark Premium Shredded Memory Foam Pillow is the fact that it is dust mite resistant, machine-washable and dryer safe (on low heat). Multiple users mentioned that the super soft bamboo cover has a classic design, and that it is very pleasant to the touch. 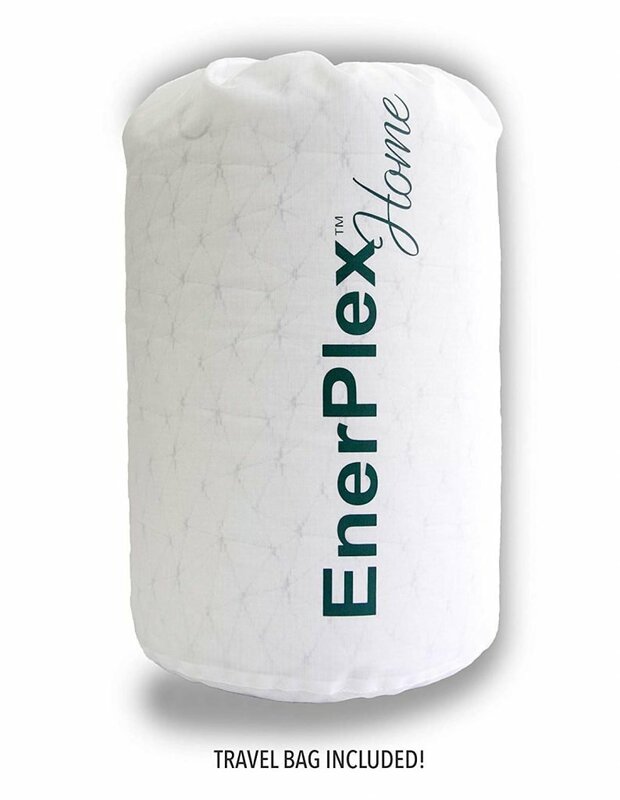 This pillow is hypoallergenic and dust mite resistant, which means that it’s a good choice for allergy sufferers, who can sleep safe and secure. Many users noticed that the memory foam pillow gets flatter with time, but that it comes right back when you fluff it up with your hands. 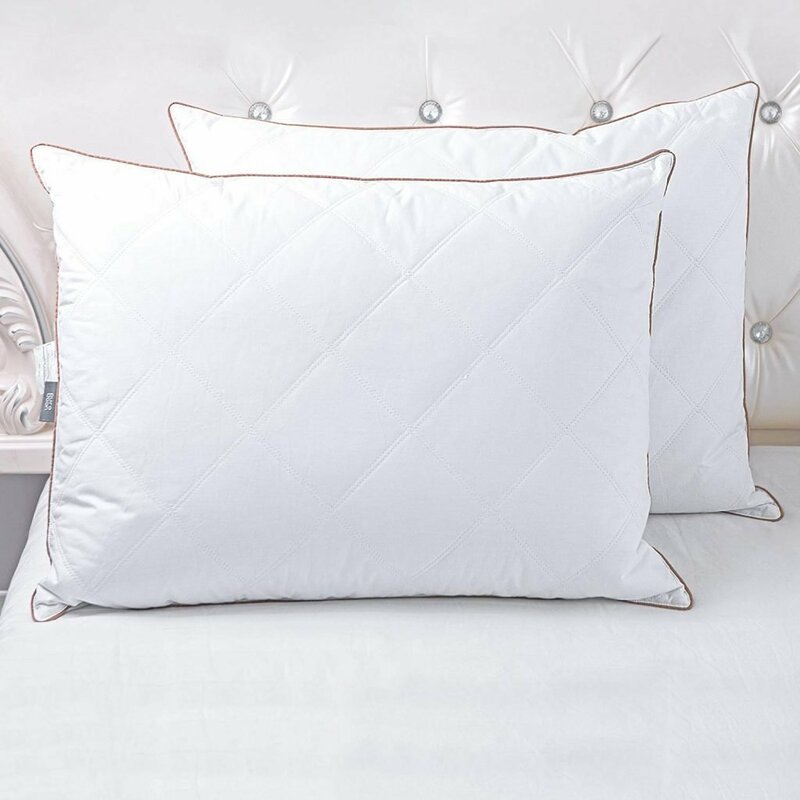 Our budget pick, the Utopia Bedding Gusseted Quilted Pillow, is a medium-firm pillow that combines a pleasant design with a comfortable feeling and long-lasting firmness. Featuring double stitching and a blue piping, these pillows are come in a set of two and work well for all types of sleepers, including stomach, back, and side sleepers. Even though you might not expect it from pillows that come with such a low-price tag, the Utopia pillows offer enhanced comfort for all sleeping positions, and most users were impressed with the quality of sleep they got with them. The pillows are machine washable for easy care, but several users mentioned that dry cleaning them may prolong their life. 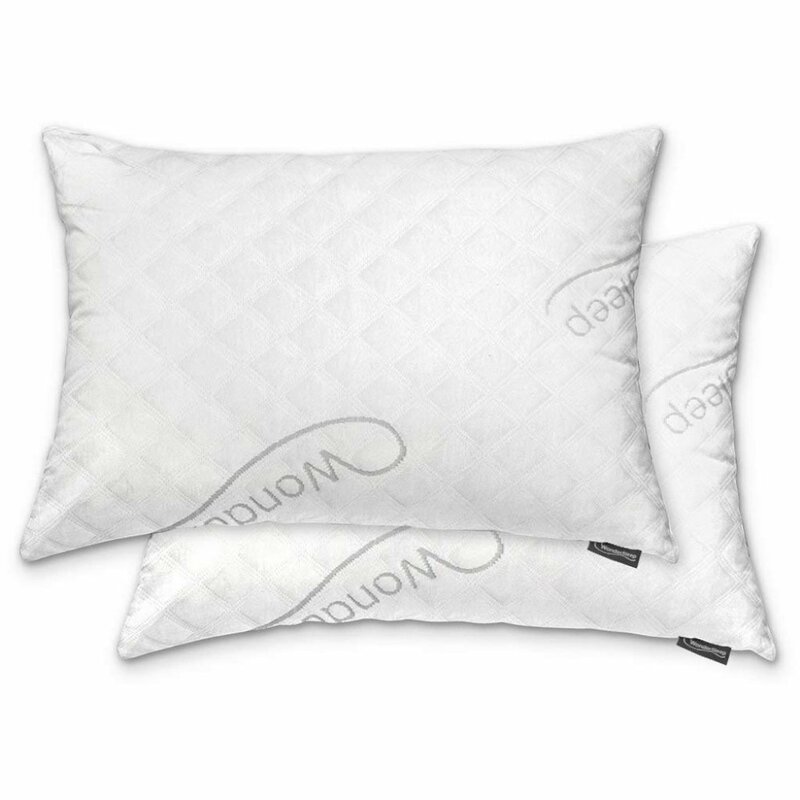 Made from 96 GSM micro fiber shell, these pillows are quite resistant to wear and tear, and their design helps you achieve an excellent quality of sleep. Some users have mentioned that the pillows lose their fluffiness over time, but they can be easily restored to their initial shape by putting them in the dryer together with two tennis balls. By tumbling them on low for an hour, the pillows regain their fluffiness effortlessly. 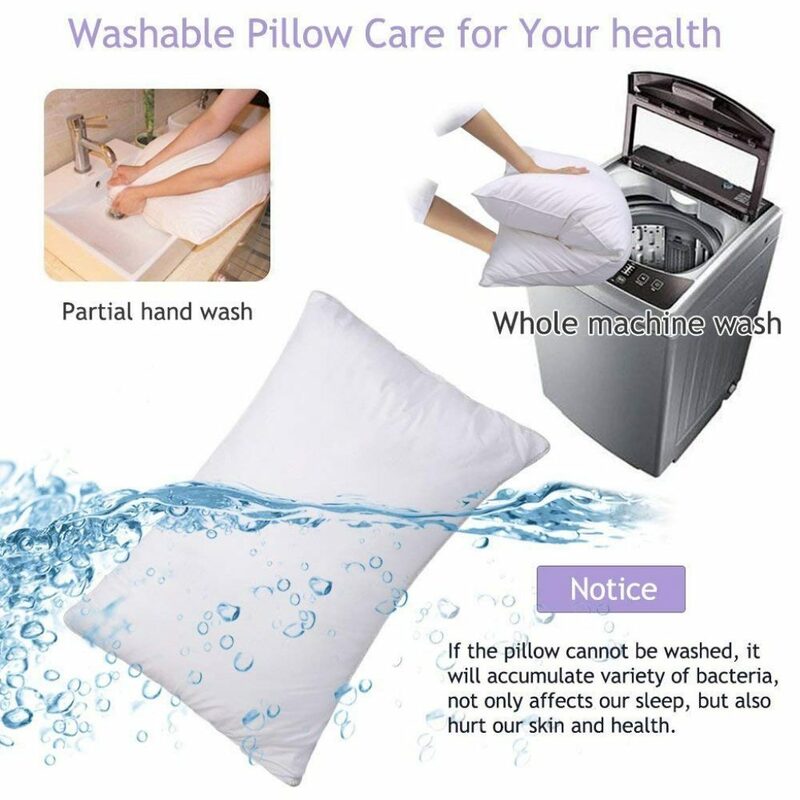 If you decide to wash them, these pillows can also be air dried, but you need to ensure they are dried off completely before using them, to prevent the apparition of mold. 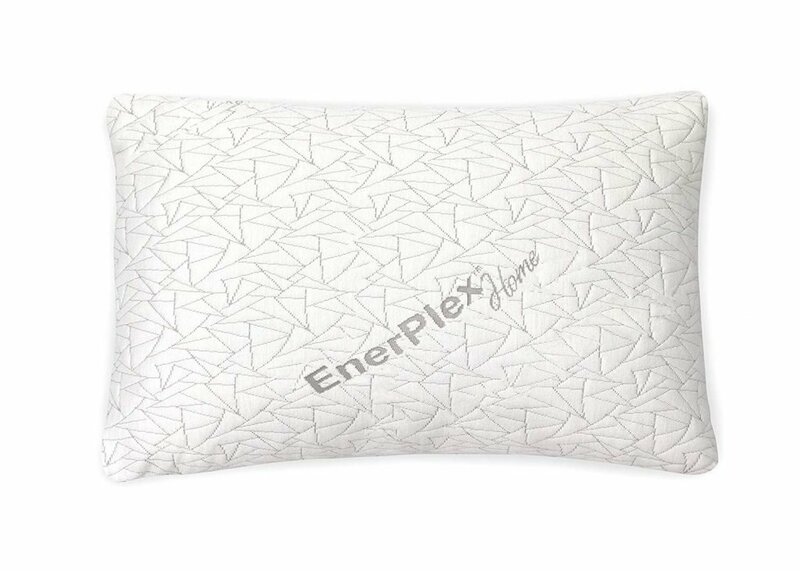 Featuring a composition of shredded memory foam and a cover made from 60% polyester and 40% rayon (derived from bamboo), this pillow is our best choice for dust-resistant hypoallergenic pillows. Besides being great at preventing allergies and even the growth of mold, the Tranzzquil pillow also comes with easy adjustment of thickness to provide the best sleep possible for you. 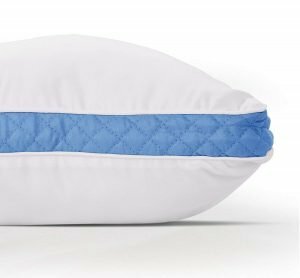 Users raved about how great this pillow feels for individuals who suffer from neck or shoulder pain, and that it is also an excellent help for those with insomnia. 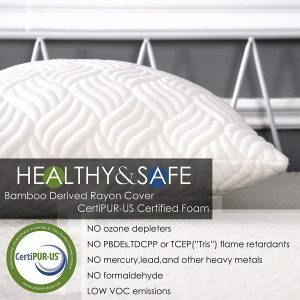 All the components of the pillow, including the removable stuffing, are made without any harmful substances, including mercury, formaldehyde, and other kinds of toxic components. 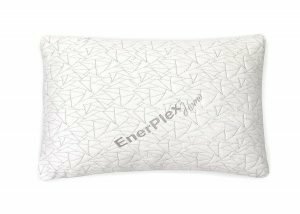 Many users mentioned that this pillow feels different from other types of memory foam pillows, in that it has more density and substance. 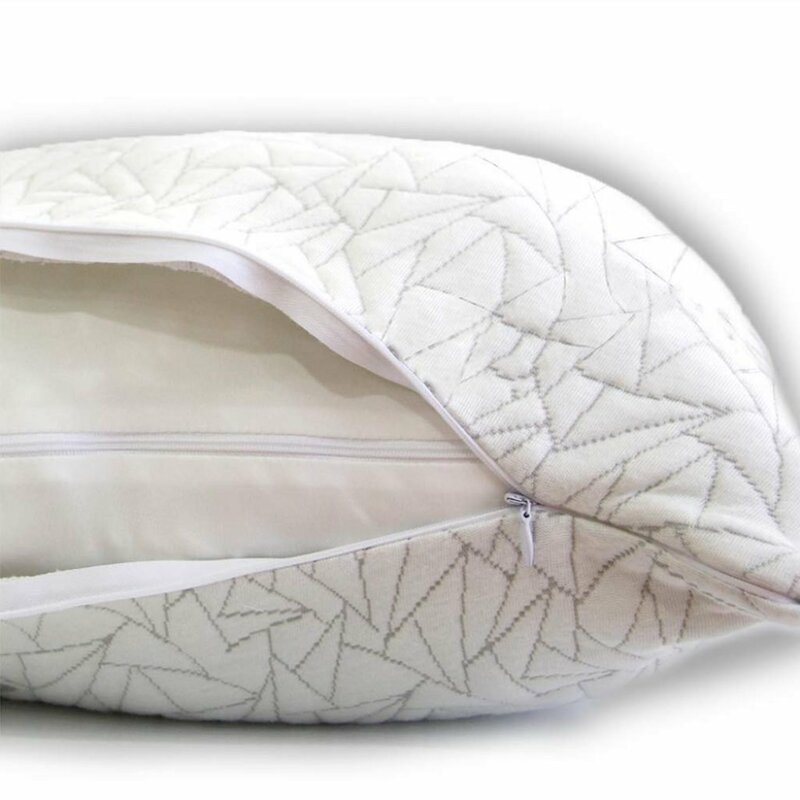 The special lines that are sewed in the cover give the pillow some resistance, which is something many users like, but others are not so keen on. The invisible outer zipper makes it easy to remove the cover for washing, while the interior zipper offers you easy access for adjusting foam. The pillow comes with a 100-day satisfaction guarantee, so you can get a refund if you’re not completely satisfied. 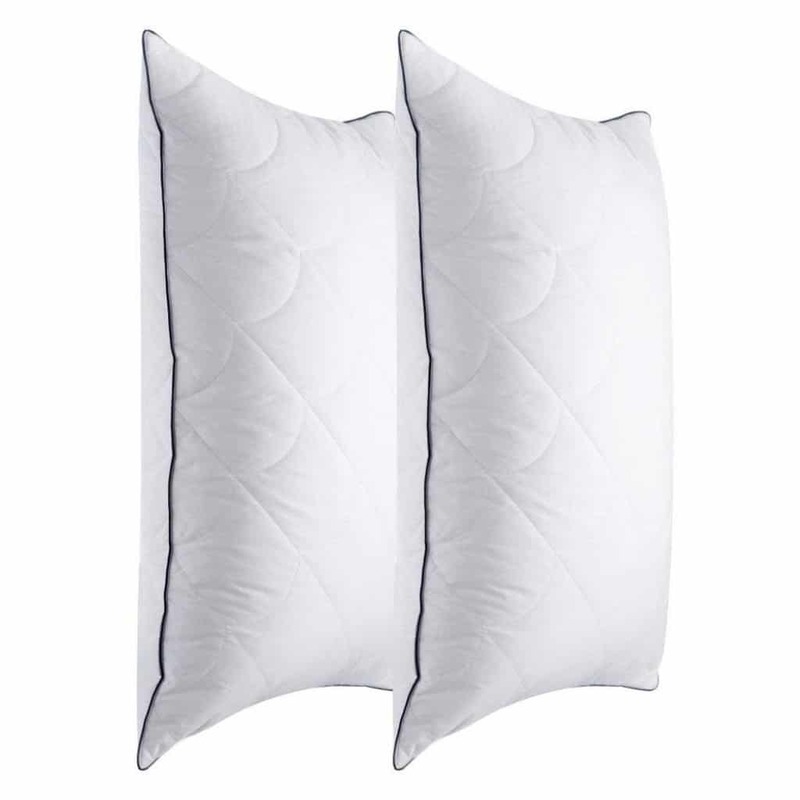 These Sable pillows work great for side sleepers because they achieve a good balance between firmness and fluffiness. 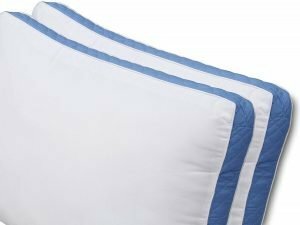 The specially treated rayon cover been praised by many users because it’s incredibly soft, while the wavepatterned case with a navy blue hem makes the pillows aesthetically pleasing. 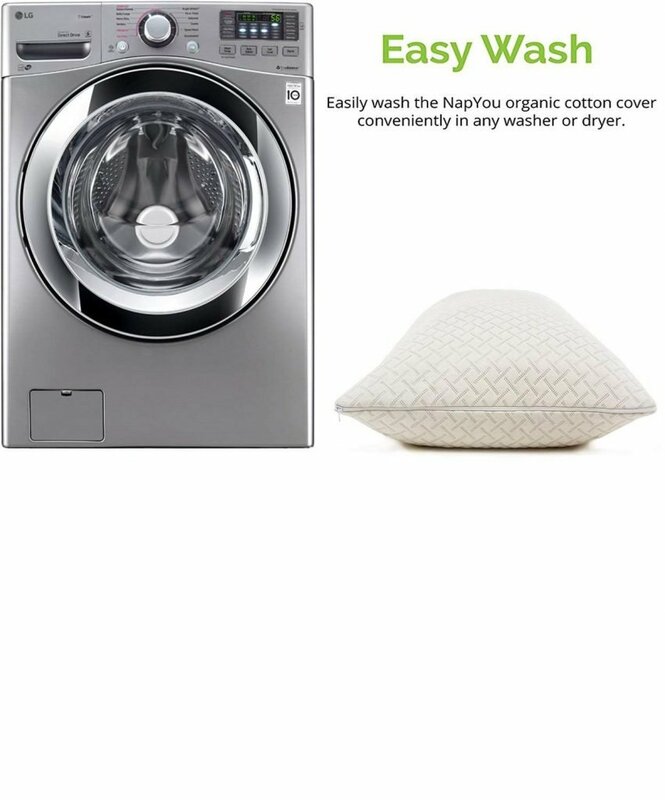 The pillows are machine-washable and safe to tumble dry on low, which means that they are easy to care for and you can also restore their fullness regularly by popping them in the dryer. The hypoallergenic and anti-bacterial properties of the Sable pillows make them ideal for those who suffer from allergies. What makes the Sable pillows different from similar models available on the market is the fact that they contain up to one fourth’s more filling, so you get to customize your bed better. 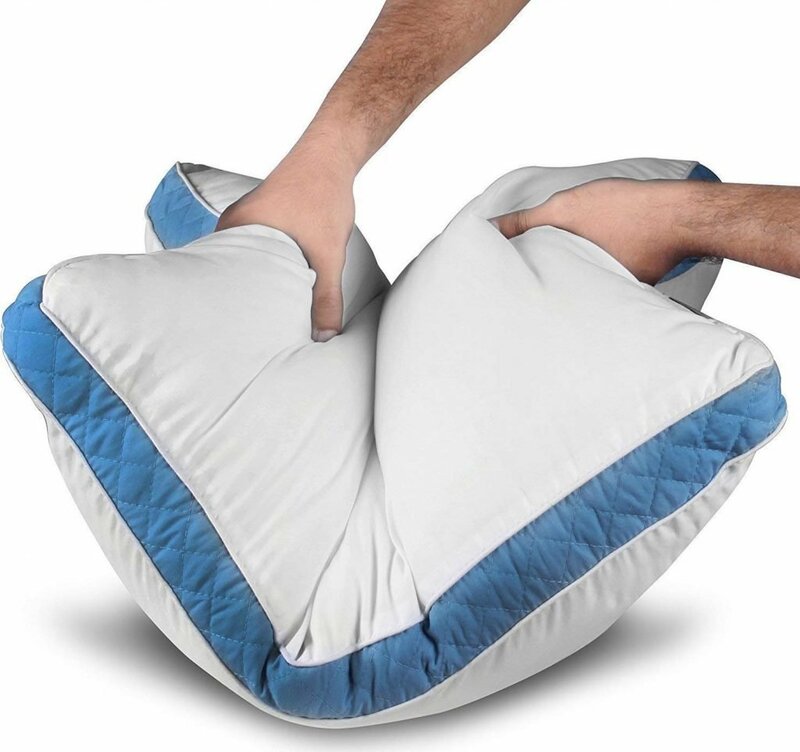 Users liked how the filling inside the pillow can be redistributed to get the pillow to a size that is ideal for their liking. The Sable pillows come in a pack of two, and users liked how well-packed they arrive, and how easy it is to use them straight out of the box. They also liked that the pillow is neither too soft nor too hard, which makes it ideal for those who suffer from various neck and back ailments. 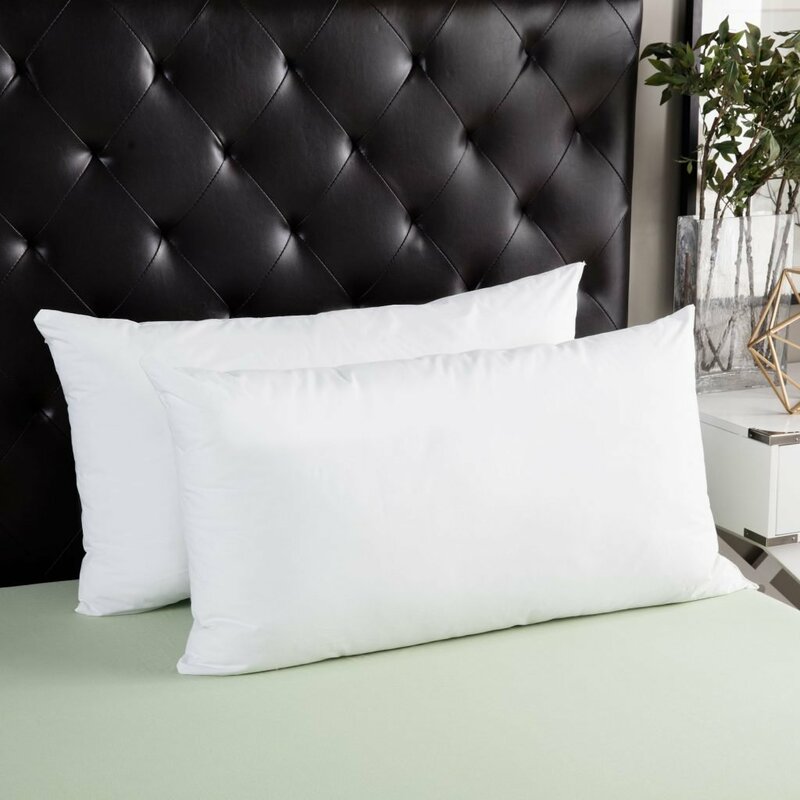 This customizable shredded memory foam pillow is hypoallergenic, dust mite resistant, and machine washable, which is everything you might want in a high-quality king size pillow. 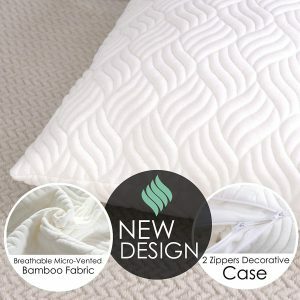 It also comes with a cover that us made from a blend of rayon derived from bamboo and polyester, for a soft feeling that not many other pillows offer. 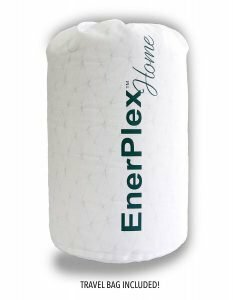 Users liked that the EnerPlex NeverFlat Memory Foam Pillow comes vacuum sealed and that it is very easy to fluff it up the first time to get it ready for use. The pillow is made without any flame retardants, and is suitable for anyone in the family, including people who suffer from allergies. Entirely machine washable, this pillow is easy to care for, and its parts can also be washed and dried separately thanks to the invisible inner zipper. 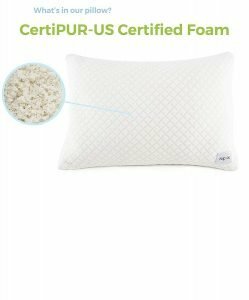 The memory foam included in the pillow is CertiPUR certified and many users mentioned that the feeling you get when sleeping on this pillow is very similar to the one you get with a down or down alternative pillow. And because the pillow aligns your spine while you sleep, it is suitable for back sleepers, side sleepers, and even stomach sleepers. Pillows are some of the most important items to consider when it comes to getting a great night’s sleep. Just as the right pillow offers you the perfect balance between support and comfort, the wrong pillow can cause back and neck pain. Below is a buying guide that contains everything you need to know when shopping for a new pillow. Many people don’t pay much attention to their needs when shopping for a new pillow, but this is a big mistake that can end up costing you in terms of quality of sleep and even your health. Choosing the right pillow for the type of sleeper you are is essential for avoiding neck and back pain, as well as migraines. As such, a top-quality king size pillow may be an investment into one’s health. If you choose to buy a random pillow without doing any research, you may find out that it goes flat within a couple of weeks of use. Moreover, some low-quality pillows may even develop mold that affects your health and is even more dangerous for people with allergies. 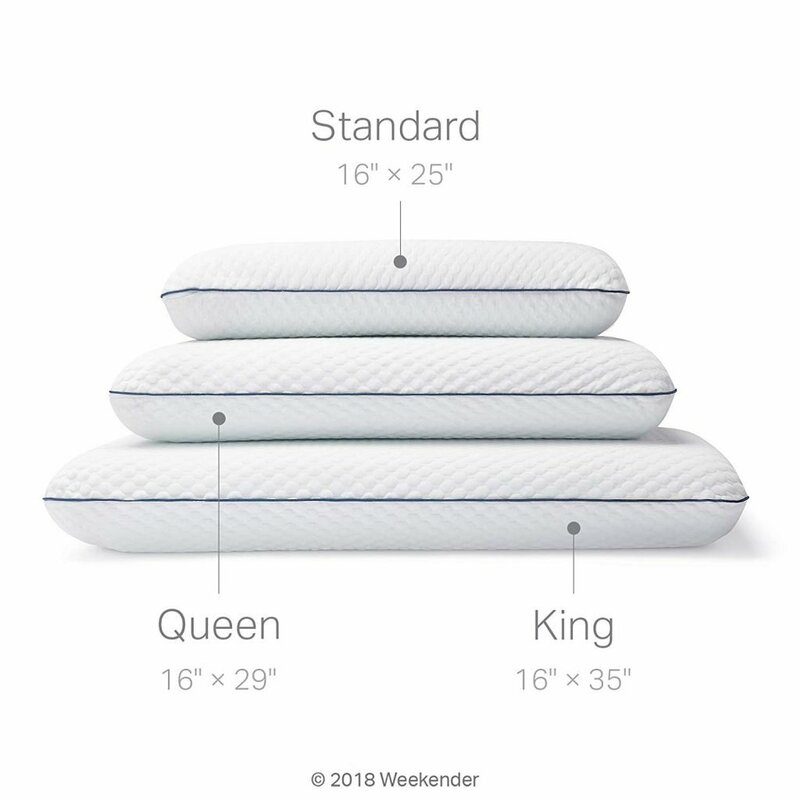 From the type of filling to the number of fellows in a set, there are lots of factors to consider when choosing a king size pillow. If you have reached the conclusion that it is time to purchase a new pillow, look at the factors below to find the perfect one for you. The two main types of fillings you can find in king-size pillows on the market are natural and synthetic ones. If you opt for a natural filling, your two main choices are feather and down. Feathers have been used for pillow fillings for hundreds of years because they trap air to create soft and light pillows that are also warm. The term “down” refers to the fluffy, soft feathers on a bird’s chest, and pillows made from them are very popular because they are extra light and soft. 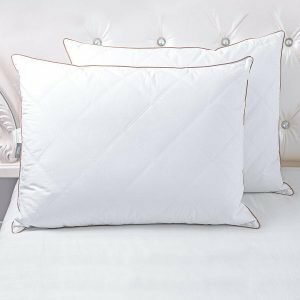 You can also find pillows made from a combination of feather and down, which are generally a good option for those looking for a firmer feel. On the other hand, if you opt for synthetic pillows, you will find out that they are easy to care for because they tend to be machine washable and quick to dry. Options include memory foam pillows, gel memory foam pillows and down alternatives. When deciding which type of pillow you need, consider whether your choice is a hypoallergenic one that is resistant to mold and bacteria, as well as dust mites. And if you live in a hot climate, consider whether you need a breathable pillow that remains cool overnight, so you don’t get too hot during your sleep. Pillow covers are available in a multitude of fabrics, with cotton and polyester being some of the most common. 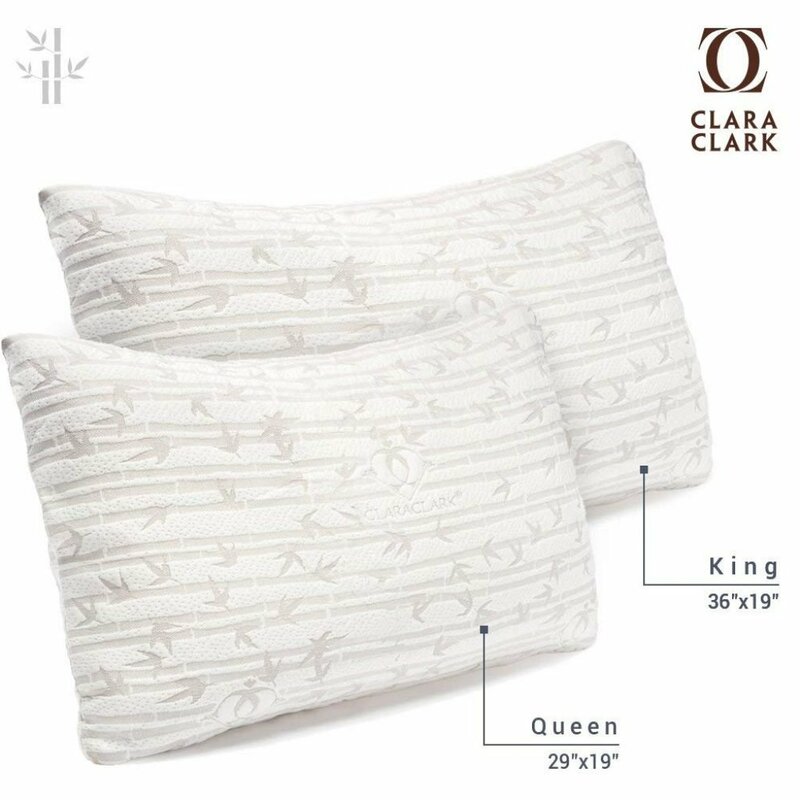 Cotton pillow covers are breathable and soft and they ensure a comfortable night’s sleep because they use natural materials without any chemical or pesticide treatments. These covers are ideal for people with skin sensitivities. On the other hand, polyester pillow covers are more durable, and they are generally less expensive than cotton ones. You can also find combination covers that include both cotton and synthetic fibers. Other options include bamboo and Tencel pillow covers, which are both ideal for hypoallergenic pillows. Finally, if you’re interested in a pillow that doesn’t overheat, look for one that comes with a cooling pillow cover that is made from specially engineered fabrics that amplify the cooling sensation while you sleep. You can choose to purchase pillows individually or opt for sets that come with two pillows, such as the Sable bed pillows and the NapYou Shredded CertiPUR memory foam pillows. Of course, it’s usually more cost-friendly to purchase a set. Machine washable pillows are an ideal choice for those who are interested in easy care bedding and don’t want to deal with the hassle of dry cleaning. Some models only have removable covers that are washable, whereas others are completely safe to put in the washing machine all at once. Keep in mind that not all models are safe for use in a dryer, so make sure you read the care instructions carefully. Pillows such as the Eden shredded memory foam pillow are an ideal choice for those who are not content with the fixed firmness of most of the pillows available on the market. Adjustable stuffing in a pillow means that you can regulate the firmness of the pillow should your prefer a truly customizable sleep. The firmness of a pillow may differ from one manufacturer to another, but as a rule of thumb, you can choose from soft, medium soft, medium, medium-firm, and firm pillows. Soft pillows suitable for stomach sleepers who like to snuggle up to their pillows at night, whereas firm ones are perfect for side sleepers because they offer great support for the back, neck and shoulders. Those who like to change positions throughout the night may benefit from a medium-firm pillow instead. Is it available in other sizes? Most of the king-size pillows we reviewed are also available in other sizes, such as queen size, for example. 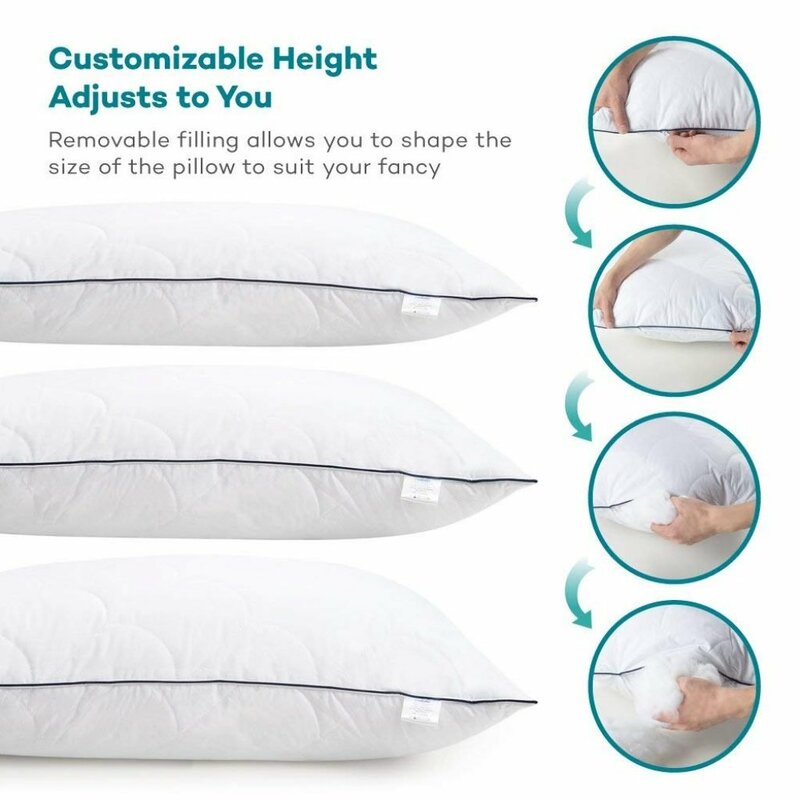 This may come in handy if you’re looking to purchase some extra pillows for additional support or decoration, but want them to be smaller. There are several main types of sleepers, but when it comes wo pillows, it’s essential to know which kind you are so you can pick the best pillow out there for your sleeping position. Back sleepers should look for a pillow that offers an intermediate height to nestle the head, so it is supported properly. Propped-up sleepers may benefit from several stacked pillows or a wedge pillow, whereas stomach sleepers will notice their sleep is improved when they use an alternative down pillow that is soft enough to allow the head to sink down. Warranty isn’t something that people think about when shopping for pillows, but many manufacturers offer a one-year warranty for material defects and fails to give you some extra peace of mind. This is usually true for premium models that are more expensive. 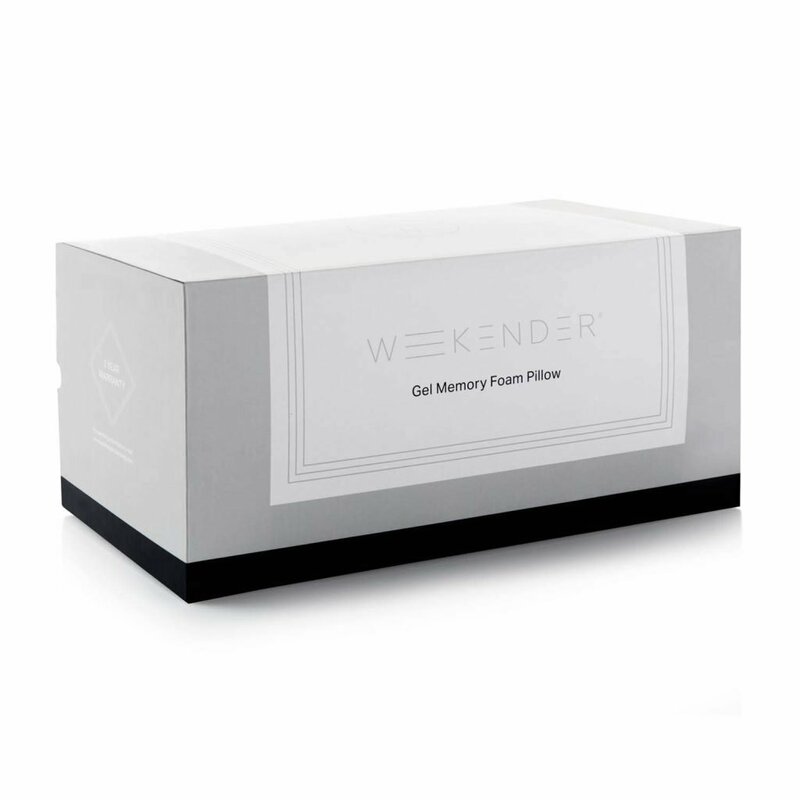 For example, the WEEKENDER gel memory foam pillow comes with a three-year warranty. Can I make my pillows fluffy again? To make your pillows fluffy again, you can put them in the dryer or in the washing machine on a dry cycle together with tennis balls tied in a clean pillowcase. Set the dryer to low heat and tumble everything together for about 15 minutes. Alternatively, you can simply fluff the pillows up by shaking them and pushing the sides in a bit every morning. Do I need to replace the stuffing after a certain period of time? A quality stuffing doesn’t need to be replaced even after years of use, but some pillows come with removable and replaceable stuffing that allows you to do just that if you want a give your pillow a new lease of life after a couple of years. 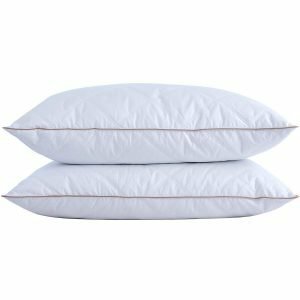 Can I get additional filling material to add to my pillows? 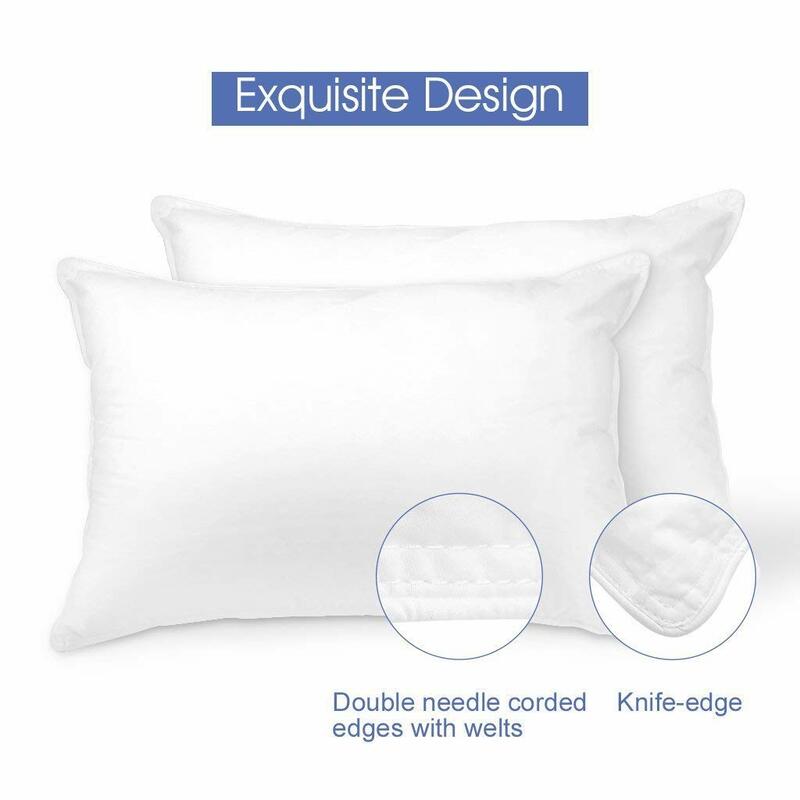 This depends on the manufacturer, but yes, generally you can get extra filling material to add to your pillows and customize their firmness and the easy they feel when you sleep. Some models even come with additional filling material from the start. How do I machine wash my pillow? Many pillows are machine washable, but you need to take some precautions before you pop them into the washer to make sure you don’t destroy them. Always use the gentle cycle of your washing machine and if possible, wash two pillows together for balance. If that’s not possible, use for towels for balance. You should never use fabric softener when washing pillows. Whether you are looking to invest in a new pillow or are looking to replace an old one, it can be rather difficult to find a model that suits your needs perfectly. 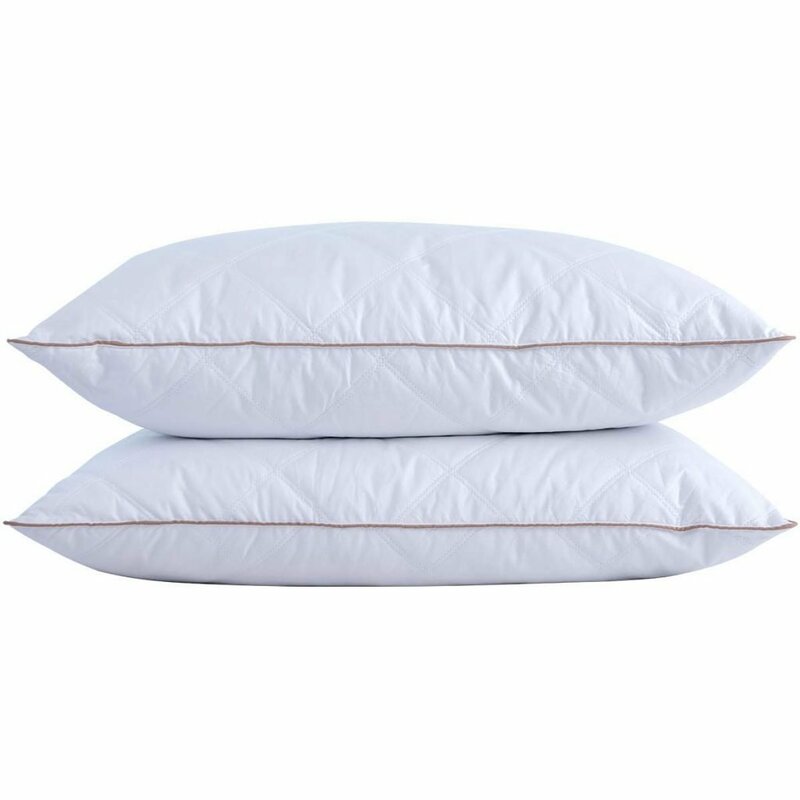 We chose the Coop Home Goods – Eden Shredded Memory Foam Pillow as the best all-around pillow because it strikes the perfect balance between support and comfort, while being budget friendly at the same time. 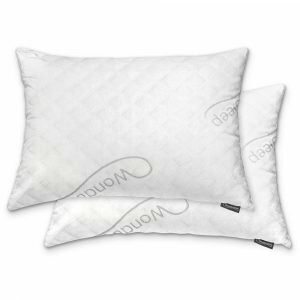 If you’re looking for a memory foam pillow instead, the WonderSleep Premium shredded memory foam pillow fits the bill for just about anybody who wants a pillow that is adjustable and incredibly comfortable. Finally, allergy sufferers may find their perfect match in the White Classic Down-Alternative bed pillows, a set that is both hypoallergenic and inexpensive. No matter what kind of pillow you need, make sure you consider the type of sleeper you are and the fabrics you or your family may be allergic to before making a purchase. 8 Best Pregnancy Pillows – Give Your Body The Support it Needs and Drift Off In Comfort! 6 Effective Pillows for Shoulder Pain — Say Goodbye to Stiffness! 9 Ideal Pillows for Neck Pain — No Aches Will Stand On Your Way! 7 Most Effective Orthopedic Pillows — Take Care of Your Health! 8 Comfy Pillows for Combination Sleepers – Choose the Best One for You!